HOUR 33: We’re on to Day Two! I’m awake! I’m awake! It’s 9am here at HQ, and co-hosts Kristen and I are officially starting Day 2 (Rachel has been on Day 2 for a while now because she’s in the future, a.k.a. time zones are crazy like that). We’re showered, we’re coffee-ed, we’re curled up with our laptops and book stacks, and we’re ready to go. I love these morning hours because it’s the time when the three of us are all awake at the same time, comparing notes and handing off tasks and trying to make things operate as smoothly as possible on the backend. But I also love the morning hours because they are full of a new, fresh (and hopefully well-rested!) energy for those of us just waking up. And we can help recharge those of you who have been going strong for hours while we all slept the night away! While we’re all three awake, then, let’s hear the all of it. What’s the best book you’ve read so far? Have you made any new bookternet friends? Added things to your TBR list? Taken a bunch of naps? Eaten the best snacks? Do tell, do tell. As per the usual, check out the Prize Page to select your swag if your name’s listed above, and don’t forget to check the past hourly posts to see if you won an earlier door or challenge prize. Haha I think I’m operating in US timezone coz I slept most of the morning and afternoon. Back at it, with 6 more hours of reading to go. Best book read so far – I Can’t Date Jesus by Michael Arceneaux. Wakey, wakey! Its gone 3pm my side of the pond, so I’m well into day 2. I enjoyed my last book of day 1 which was an ARC of Sweet Bitter Cane by G.S Johnston, a #histfic set in the sugar can fields of Northern Queensland. I’m also enjoying my current book, a bit out of season but an Xmas feel-good romance. A Little Christmas Faith by Kathyrn Freeman. Happy reading and thanks for all your hard work organising this readathon. 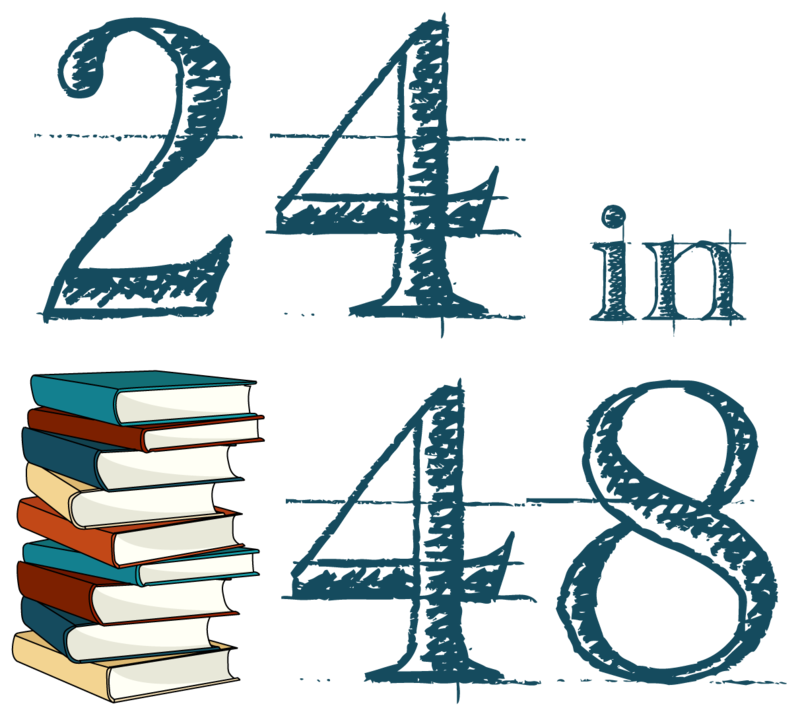 …Hour 33, Day Two of 24in48… and what does 24in48 reading marathon mean so far? For sure despite wanting to roll through a stack of books, I had to find a way to remain connected to 24in48 without accomplishing a stack of finishers, BUT I am planning on making progress with some picks I did start and I WILL FINISH ONE! Books I love that I have started – A Few Red Drops – The Chicago Race Riot non-fiction by Claire Hartfield – is AMAZING and a read everyone should delve into. I think it amazing to find out from various authors – via historical perspective, of cites we come to know as tourists. It is scary how many relative incidents can be pulled out and pointed to, today as well and contemplated amidst events in the last 2 years or so as well. Secondly – The Journey Home – My Life in Pinstripes by Jorge Posada was a book I would not go out and get myself (those are the best gifts!) and yet it is an account of how a family life and lessons learned shaped his life playing in New York; sometimes you get a book not well written by an athlete and this one DEFINITELY is –wow. Success marked his personal and professional life for many deep seeded values he was instilled with. Lastly, I made a vow to dive into books that I know nothing about and answer – or try to find out- why are they in our high school library? – if not obvious. The Wheel on the School addresses these points made – “…We can’t think much when we don’t know much! From now until tomorrow morning when you come to school again, will you do that? Will you wonder why and wonder why?”…all centered about why storks stopped coming to a village of Shora in Holland. Taking place in Holland, this novel by Meindert DeJong to me, seems to be a hidden treasure that while geared towards children, has a more important message to adults and all individuals, that they need to stop and wonder why and then try to work together to make something happen that would be good for the world around them – this simple, elementary approach to the story carries a much heavier Adult theme if readers take time to view it that way, which today applies to preserving on the verge of extinction animals, wildlife, issues of food and water shortages, preserving our climate in the midst of recycling, waste, and ecosystem issues, political, social, historical divides and quarrels, and about 100 other issues that COULD be solved if we agreed that we disagree, but our biggest goal is to solve for our generation and for future generations. Yes, I am not content that I have not started and will finish with a stack of 20 books this 24in48 episode, but am thankful for other reasons for this January 2019’s 24in48!